I have quite a few things on the go at the moment so i thought I would give you a run down on the easy ones. Firstly, I am a great fan of Camberwick Green - Trumpton - Chigley and have a large collection of the Robert Harrap series of figures. Recently, I have been increasing my collection of "the soldier boys that live in Pippen Fort". I have Captain Snort, Sergeant Major Grout, Private Meek and A.N. Other plus the bugler. What I don't have is Pippen Fort to stand them in front. 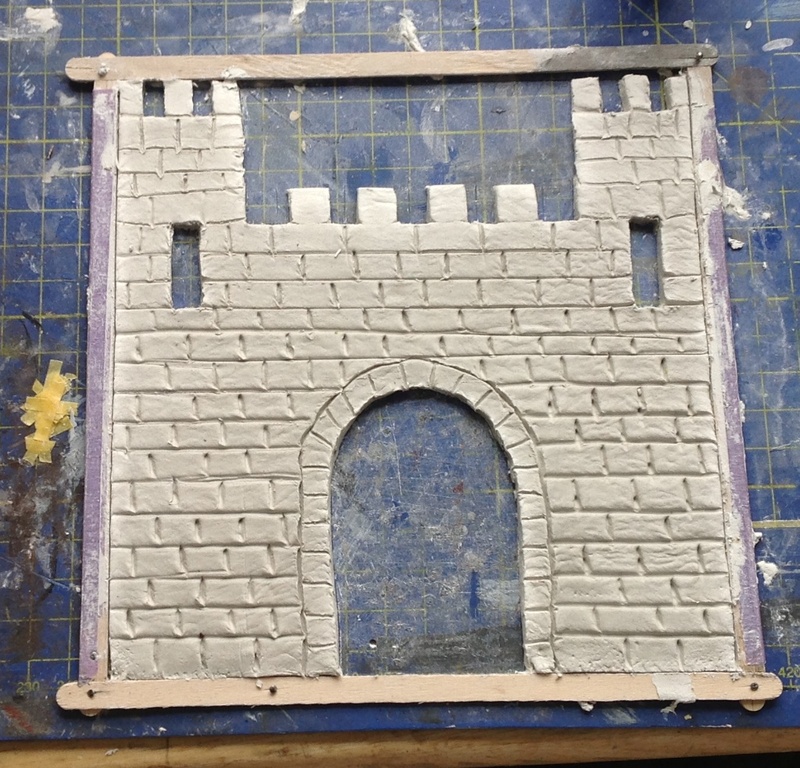 I bought a packet of white DAS - this is an air dried clay - and am in the process of making the front of the fort. 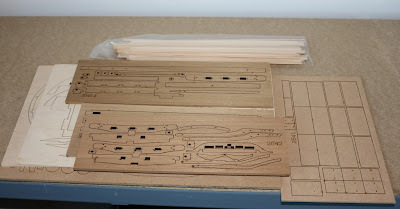 I laid out some Starbucks stirrers to double depth. These gave me a frame to work to but also gave me some supports for rolling out the clay to a consistent 3mm/ 1/8" depth with Valerie's rolling pin! Once dry, I will lift it and cut a sheet of plastic card to go behind for support. 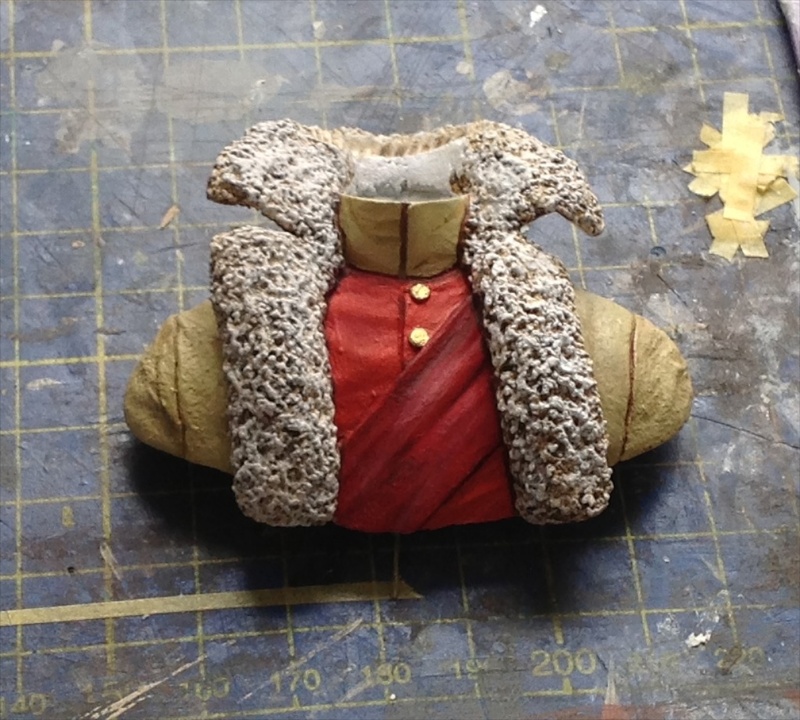 I then have to make both sides (but only 1/4 depth). 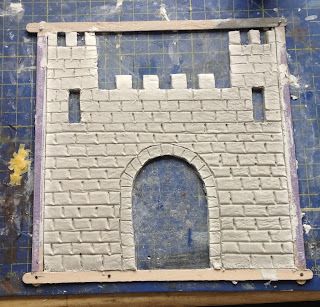 The fort stands 6" high so this will look great behind the soldier boys. 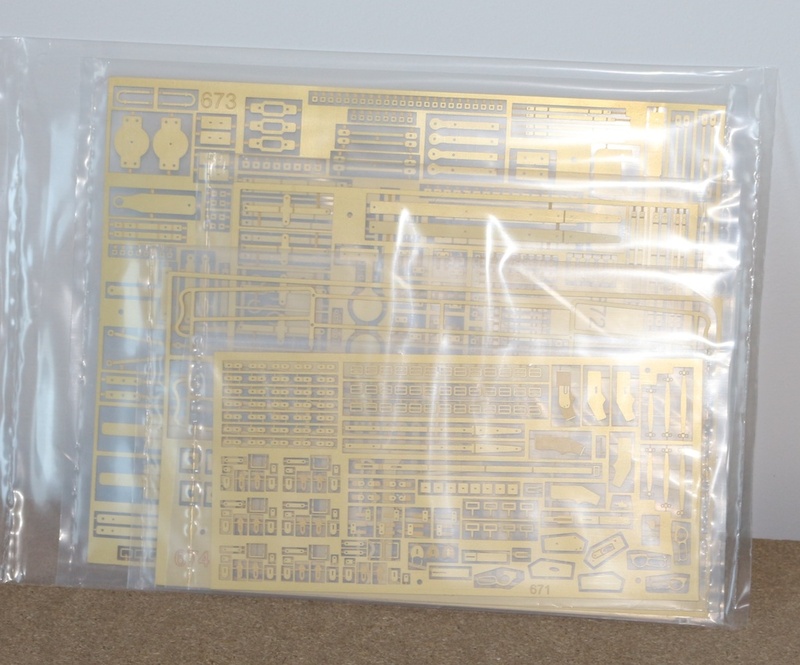 Having enjoyed making the 1/144th Ju-52 recently, I noticed a little kit from Revell when I was in the Cheap Shop - Tiptree on Saturday. As it was only £1.99 I thought - "Why not". I expect to have this finished before I go to Clacton to the model club on Thursday. 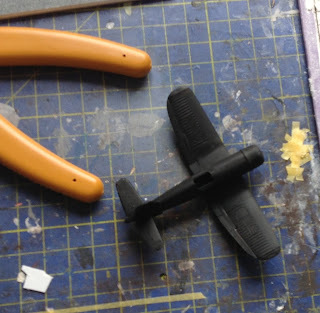 As you can tell from the handles of the cutting shears, this is not a large kit! It needs painting up in Gloss Sea Blue and then some decals. A quick job. All I can show you is the body as the head is in the middle of a large paint job. This is pretty much finished. That's all for now. 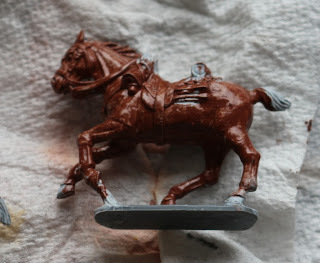 The Stagecoach is getting on well but I am trying to finish these projects before i get back on to it. 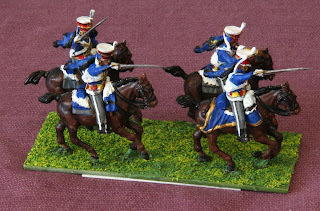 I thought I would try out the Perry Miniatures 28mm figures and bought a box of the Hussars last year for "my retirement". I posted some start up images a couple of weeks ago. Well, I have worked long and hard on these. The real pity is that the camera is a hideous revealer of blemishes because you have to enlarge the image so much when you are dealing with things this small. 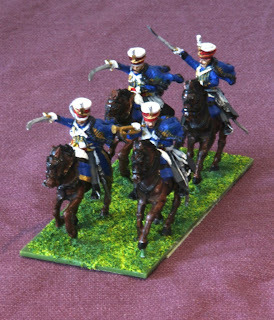 In the real world, they look "quite" good, but remember that these are the first figures of this size that I have painted for 15 years - ever since I stopped painting Warhammer back in the 1990s. The last time I painted any Napoleonic figures was around 1975 so this is a real rave from the grave. Well, here goes. I will try for some better images later. If you dare, you can click on either image and you will see a much bigger version. Oh my, does she like to give me trouble! So, not content with getting me to buy three intricate resin busts, she then gets onto me about "finding something to do", as though making scale model aircraft, building a model railway, painting busts and sewing a tapestry tea cosy isn't enough - but then I do love her - grin. It all started with SWMBO wanting a yacht on the shelf, because she sees them going past the balcony all day every day. It turns out the Cornwall Model Boats has a great selection of these things, both for R/C and static. However, I expanded my looking to the non-boat sections. 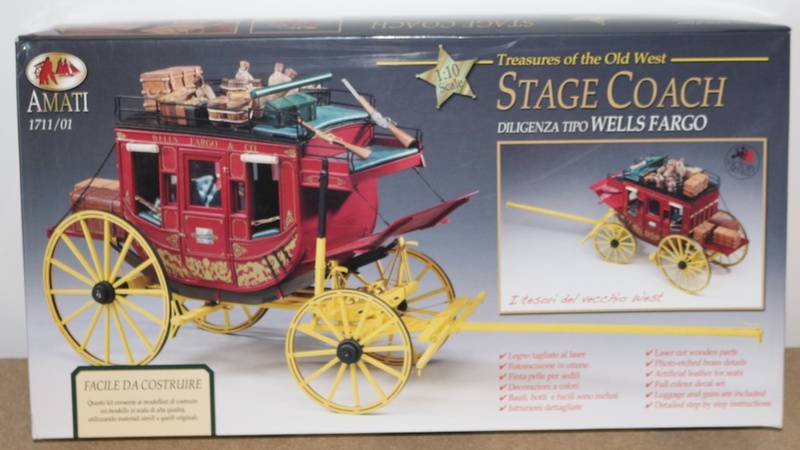 SWMBO followed up and having rejected my ideas for some nice 1930s yachts at reasonable prices - for instance - she fell upon a 1/10th Wells Fargo stage coach. It is 695 mm long, 278 mm high and wide 187 mm, oh and costs a measly £196.00. They do free delivery - hooray. You may, or may not know, back in 1970 I worked for American Express in London as a Deutsche Mark trader. Now, it is a little known fact that two of the original owners of American Express were a certain Mr. Wells and a Mr. Fargo! In the entrance to the bank branch in Abchurch Lane, E.C. 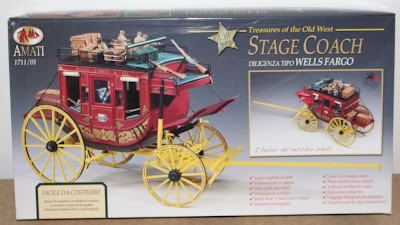 was a scale model of a very similar stage coach. So, what did I say? The man said "yes". It arrived today. Here are some shots of the box and the interior. I think that I have a long term job on my hands. 19" x 10" x 3" and 7lb in weight - in new money that comes out at 482mm x 256mm x 77mm and a thumping 3.2kg. 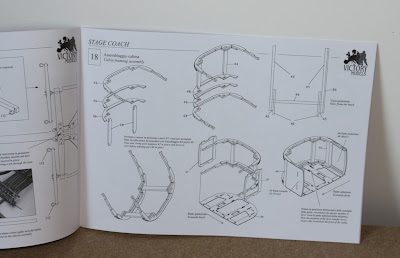 The instructions are very comprehensive with lots of pictures. here is a taste. The plans come in a pile about 1/2" - 12mm thick. 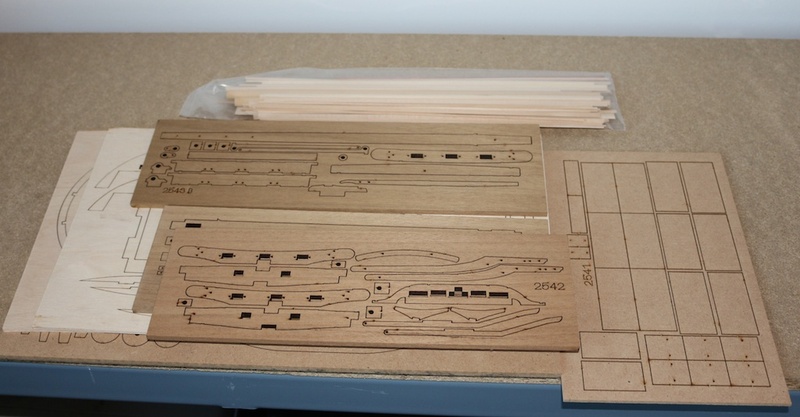 There is an extensive pile of sheet wood with a bag full of extra bits. 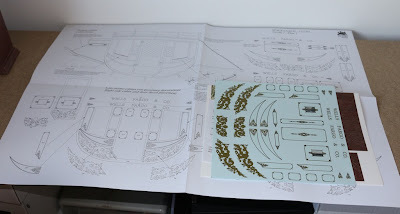 Lastly - joy of joys - there are three large sheets of etched brass! It is - make your own padlock using multiple layers of etch - time. It is just as well that I already have a NWSL Chopper II and a Mission Models Etch-Mate. These should make cutting and folding a bit easier. 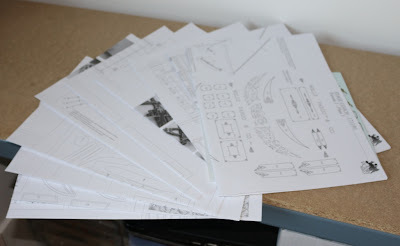 Mind you, the big sheets of basswood remind me of the balsa rubber band flying kits we used to make when boys - no laser cutting here - carve it out yourself. All joking apart, this will be a good change from what I have been doing for the last 10 years and should take me quite a long time. I will report progress as and when. BTW, she didn't really have to twist my arm too much - I was already sold - but don't tell her that - grin. I keep hovering between making one or other of the two Eduard special kits that I have in stock. One is their 1/48th P-38 for late war aircraft in Europe and the other is for Northern Europe F-16s. I keep looking at the first step - the cockpit - and putting both kits back. I have also bought a box of 6 shades of red by Andrea as I now have some British Scarlet to paint. Just imagine, me buying paint! In the meantime, I thought that i would get back into the swing of painting figures and retrieved a box out of my stash. 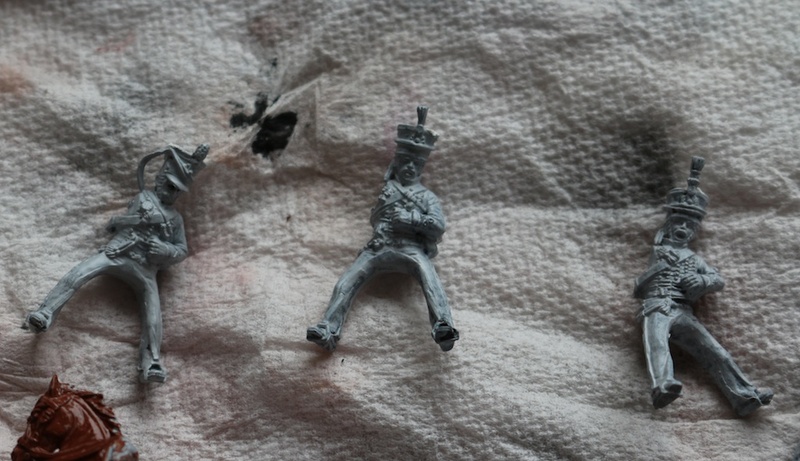 Now, these are 28mm plastic figures. 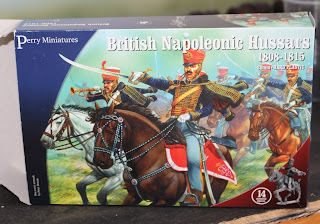 You might ask "what do I know about such things" but I cut my teeth on 30mm Hinchcliffe Napoleonics back in the early 1970s so, if I dig deep, I should be able to manage. I am only trying four of them to see how it goes. 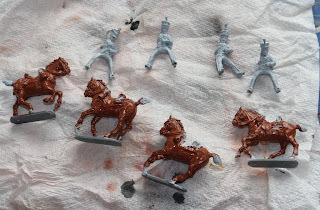 I have put the four together, at least partially, and have undercoated them with some Vallejo grey polyurethane primer. Here is where I am at the moment. More pictures later. As a comment on the box, the contents are nicely moulded with very little flash at all. You get lots of heads, arms, swords, bugles etc. 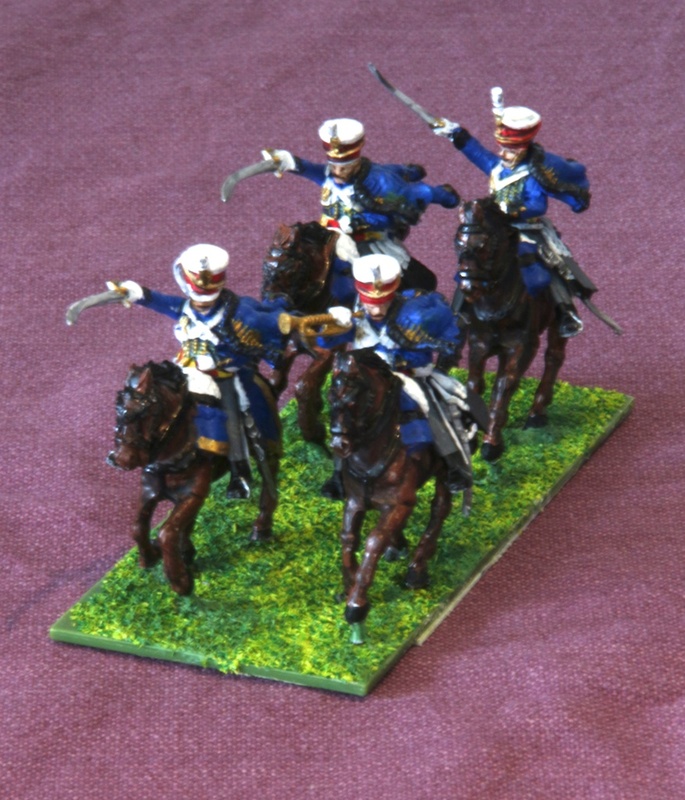 so that you can make a representative company of Hussars. 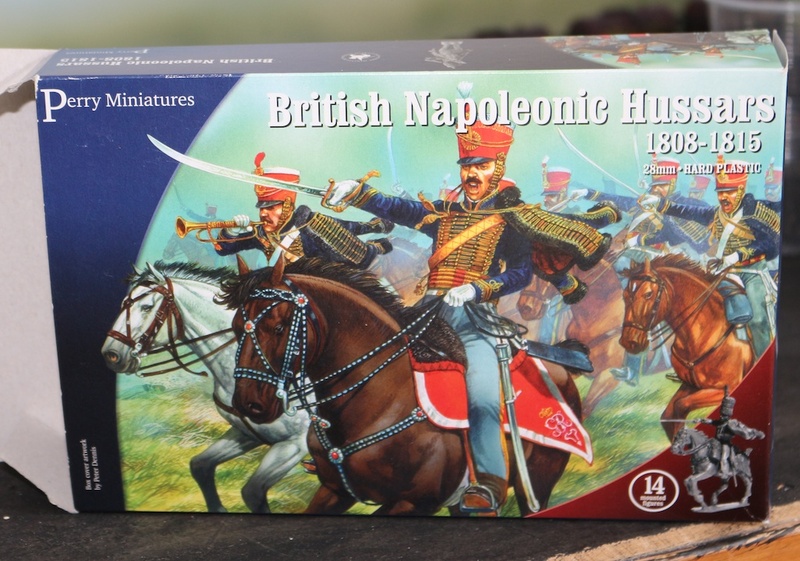 Inside the box is a full colour page of every Hussar regiment during the period. However, they only show you the left hand side of every one - no right hand sides on show at all. Plus there is no real coverage of the horse furniture, so it is back to the two Gs - Google and Guesswork!